looks very much like a used condom. So I'm gonna count that towards my 15 minutes of fame, too. I told everyone at the coffee shop that I knew the girl "Jill" in the article. They didn't believe me and thought I was name-dropping. 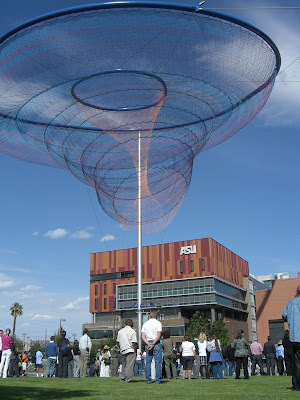 So what makes the art piece look like a USED condom, as opposed to a NEW condom? This comment frightens me very much, because it makes me question whether you've ever used a condom. And that makes me question how many little Wayne's are out there right now. See?? VERY frightening. I have never seen this "art" masterpiece. Must be hidden in that vast "downtown" we have. Condom...I can see that! To think I have been using at as a golf aid.